Every series was tied at 1 going into the Game 3s. Would we see dandies or blowouts? Well we got those and more, from a Pierce buzzer beater, to a decimation in the Rockets-Clippers clash. Here, we review each game, along with the notable stats—like we've been doing all postseason. The Cavs had momentum going into game three, they would get JR Smith back and Iman Shumpert was playing great as of late. But, it'd be tough to steal one in Chicago. The Cavs were playing pretty well in the beginning, they jumped out to a 6 point lead and Lebron led the way with 5 in the first, he was sharing the ball beautifully as he had 7 assist in the first. The Bulls went on a 6-0 run to take the lead midway through the second, but Cleveland would go on a 6-0 run as well to regain the lead. To close the quarter, the Cavaliers would lead by two and James ended with 7 in the period. A 7-0 run was ran by Chicago as they would take a one point lead. Afterwards, both teams kept exchanging baskets and they both had the lead so many times in third. Rose led the way with 10 in the third. Near the end, Lebron missed a layup to take the lead but was just short. Gibson then made two free throws and extended the Bulls lead to three. But, Smith saved the day with a huge three pointer with 10 seconds left to tie it. 3 seconds left, Rose gets it goes right for the three to tie the game and it's GOOD OFF THE GLASS! Derrick Ross hits a buzzer beater three to win the game and take a 2-1 series lead for his team, the play was executed so well and Drose just nailed the shot. Notable Stats: Rose- 30 PTS, 7 AST. Noah- 11 REB. Lebron- 27 PTS, 14 AST. Thompson- 13 REB. Washington was without their star PG John Wall, but it didn't seem to be a problem, well maybe it did. Ramon Sessions would have to play a different role in game 3, and it would be him starting. He played very good in the first as he scored 7 & Nene scored 8 and the Wizards were up 10 after one. Paul Pierce asked if he called bank on his game-winner: "I called GAME." The Wizards kept their lead at a medium paste and never lost it, Nene was rolling as he scored 5 in the second. Washington extended their lead to 19 after three and Porter dropped 6, Pierce, Beal, & Gooden contributed as well to build on their lead. It looked like they had this one in the books. Washington was up 20 with 7 minutes left, but the Hawks went on a 17-0 run to cut the lead to three. With 14 seconds left, Muscala hit a three to tie the game. Paul Pierce dribbles up pulls up while three guys look to block him at the buzzer and it's GOOD! THE TRUTH BANKS IT OFF THE BACKBOARD AT THE BUZZER FOR THE WIN! It was just like Saturday, what a game this was. The Wizards win a huge game without their point guard. Notable Stats: Nene- 17 PTS, 7 REB. Beal- 17 PTS, 8 AST. Teague- 18 PTS, 7 AST. Horford- 10 REB. CP3 is back, and it's a big help for the Clippers so they can extend their lead in the series. JJ Redick was amazing in the first, he scored 11 in the first and LA was up 9 in the first. The Clippers team as a whole did good in the second. Redick, Griffin, & Rivers scored a lot and they kept their lead at 7 going into the half. Austin Rivers was sensational in the third quarter, he scored 15 points and he extended the lead for the Clips to 23. Houston never came close in the fourth, the Clippers were so dominate and they couldn't lose momentum the rest of the way. Notable Stats: Redick- 31 PTS. Jordan- 15 REB. Paul- 7 AST. Harden- 25 PTS, 11 AST. Howard- 14 REB. Memphis was confident going into game 3, they had their point guard back and they were going back home. The Grizzles were up 3 early, Randolph led the way with 6. Memphis went on a 8-2 run and had all the momentum in the world and they had their home crowd by their side. Gasol scored 10 in the third period and his team was up 16 going into the half. 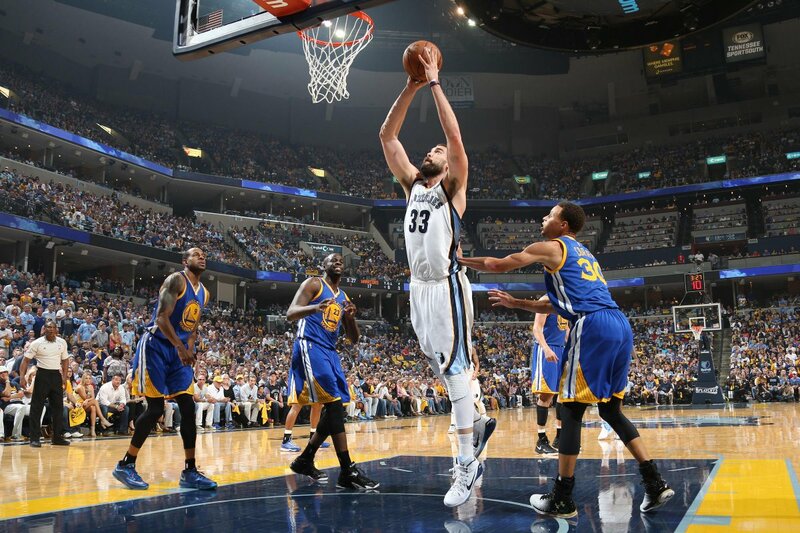 The Warriors had no answer for Memphis, they would score but couldn't get a couple of stops in a row to make a run. Zebo had 10 in the third and was unstoppable in the paint. Golden State went on a 22-5 run midway through the fourth and were only down 4 at a point. But after Courtney Lees three they had no hope left and Memphis put them away. It was a fun game to watch, Memphis played so well and they got that motivation from their crowd and it's hard to win in that arena, as for Curry, he's gotta show up in game four or else he's gonna dig himself and his teammates into a hole. Notable Stats: Randolph- 22 PTS. Gasol- 15 REB. Conley- 5 AST. Curry- 23 PTS. Thompson- 8 REB. Green- 7 AST. More drama in store for the 2015 NBA Playoffs Game 3, Round 2.